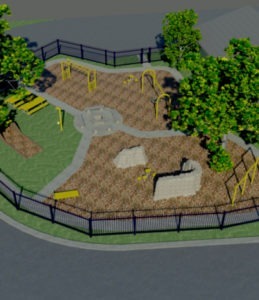 Pro Playgrounds can provide professional playground design and planning services that are unmatched. Utilizing both two dimensional and three dimensional design software, we are able to provide our customers with the most accurate and realistic playground designs in the world. You will be able to actually walk through your playground before it is built. Our playground design service is second to none in the playground industry. Many of our clients know they need a playground or recreational space, but they are not sure where to start. At Pro Playgrounds, we take the guess work out of the process. We work with architects, engineers, contractors and governments to design some of the coolest play and recreational spaces in the USA. We can custom design the area and the equipment to be in unison with your community and theme, making your community, school or business one of a kind. In addition to this we have solved countless problems with odd spaces and unique situations in which we have created custom tailored solutions. Complete park, playground and recreational area design. Custom engineered solutions for unique spaces, layouts and materials. If you have problem with a playground, chances are we have seen it and we can solve it. What playground equipment is most likely to create conflict, such as fighting over a swing or spring rider. What playground equipment may increase your annual costs for liability insurance and why. What playground equipment children tend to injury themselves most frequently on, more importantly, why, how and how to prevent or minimize it. What playground equipment children tend to use most often and find entertaining. At Pro Playgrounds, we understand a playground is an investment, and like any investment proper planning and design is crucial to its long term success. There is far more to installing a playground then just showing up and putting the pieces together. Pro Playgrounds pays attention to make sure that every detail of the playground installation process is intelligently thought-out. This is why we have spent so much time developing our playground design process. We design our playgrounds literally from the ground up using a simple by effective playground design process that is simple and effective. We then analyze the sub surface and drainage/water management of the area. Having a playground that is dry and drains quickly is of crucial importance, especially in United States. Standing water, mud and puddles make for a very slick, dirty and dangerous playground that is prone to pests and insects. The third step in our planning process is playground surfacing. We provide samples and discuss playground surfacing options, prices and qualities. A quality impact absorbing playground surface is not optional, it is the most important safety feature of any playground. This is why we address it so early in the planning process, before we even begin to consider actual equipment options. Aside from public playgrounds; most playgrounds will require a system for security and containment. A fence of proper size should be installed at the playground to keep the children in the playground and unwanted or unauthorized individuals from using the playground both during and after business hours. We can provide you with fencing options and quotes, or refer you to one of our recommended installers. Once we have decided on the “foundations” of the playground, we can begin to discuss playground equipment, accessories and amenity options. By this point in the process we will have a better understanding budget wise of what your organization can afford. Once we have an idea of what types of playground equipment and features you would like and can afford; we provide you with accurate scale drawings depicting the equipment placement, safety zones and traffic control. You can actually see how your playground is going to look and be placed. We provide you with as many options as you would like within your budget so that you can be sure you’re getting exactly what you and the children want.